Invasion Of The Body Snatchers Blu-ray review . If ever they convene a tribunal to finally determine, once and for all, whether remakes can ever be A Good Thing, this sublime reboot of the paranoid 1956 classic about people being replaced by emotionless duplicates will be Exhibit A.
Appropriately for a film about the loss of identity, it’s an immensely characterful piece, full of oddball types and quirky details. Donald Sutherland’s public health inspector, a goggle-eyed, jazz-loving hunter-of-rat-turds, is not your average hero, and his relationship with colleague/best friend Elizabeth (Brooke Adams) – a married woman – is hardly standard Hollywood fare either. 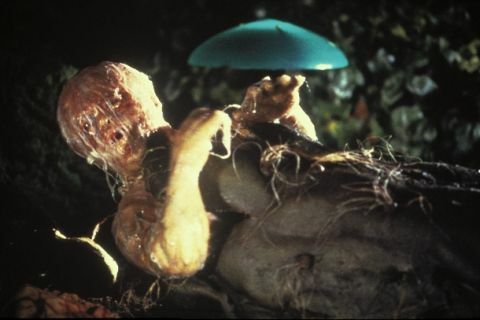 Director Philip Kaufman’s slow build allows you to grow fond of these and other eccentric characters, making their threatened annihilation all the more disturbing. His direction is equally quirky, combining Dutch angles and noir shadows with handheld street footage that turns crowds ominous, while cinematographer Michael Chapman displays the same prowess with night shooting that gave Taxi Driver its distinctive look. Transposing events from small town Santa Mira to the depersonalising environs of the big city (San Francisco) adds a fresh angle, as does a new emphasis on grotesque, gooey effects; thirty-six years on, the flesh-flowerings as the uncanny doppelgangers are born remain remarkably revolting. Anything but pod-person filmmaking, it’s a rare remake which arguably exceeds the original, and at the very least is an equally valid interpretation. Carried over from the DVD are a decent commentary by Kaufman, and the trailer; not carried over, thanks to a spotless digital restoration, are scratches and marks to the print. Four of the featurettes (39 minutes) originate from a 2007 region one release: a general overview, plus pieces on cinematography, special effects, and sound design. The latter, in which Ben Burtt explains how he used a bicycle pump, a scuba regulator and various fruit and veg, is particularly interesting. The three new featurettes are all talking heads pieces with experts: Kim Newman is joined by directors Ben Wheatley and Norman J Warren for a rather meandering discussion (52 minutes); an academic talks up Philip Kaufman’s auteur credentials (17 minutes); and the author of a book on author Jack Finney provides an informative overview of his career (11 minutes). A 52-page booklet featuring a new essay and reprints of ‘70s features completes the package.